PHILADELPHIA, PA --(Marketwired - April 27, 2017) - MS in America 2017, a national survey of more than 5,300 individuals diagnosed with multiple sclerosis (MS), reveals many people initially received an improper diagnosis and have trouble finding an effective treatment. The Health Union survey, conducted between January 25 and March 1, 2017,and released through its online community, MultipleSclerosis.net, also finds patients struggle with pain and symptoms that impact many aspects of daily life. MS in America 2017 is the fifth annual Health Union survey about the condition. Multiple sclerosis is a lifelong, incurable disease that affects the central nervous system, including the brain and spinal column. It is chronic and progressive and can vary in intensity from mild to severely disabling. In more severe cases, it can interfere with the ability to move, see, think, swallow, talk, or feel. Receiving a proper MS diagnosis proves extremely difficult for many patients, and almost 50 percent of survey respondents reported having five or more office or hospital visits before obtaining their MS diagnosis. Forty-two percent of respondents reported they were initially misdiagnosed with another condition, including depression (25 percent), migraine disease (15 percent), fibromyalgia (14 percent), psychiatric disorder (13 percent), B12 deficiency (11 percent), and chronic fatigue syndrome (10 percent). "Getting a proper MS diagnosis continues to be a difficult process. I know many people who end up with inexperienced doctors or even have symptoms they don't mention because they don't realize it could be MS related," said MultipleSclerosis.net patient advocate Devin Garlit. Once diagnosed, patients do seek treatment, with 65 percent starting within three months. "Finding the right treatment can be a difficult process that takes a lot of trial and error. You may have side effects with one, the next may not work well, another may not be covered by insurance," Garlit explained. "We're very lucky to live in a time where we have a lot of treatment options. It takes a lot of perseverance to find the right one though. It was 13 years before I finally found a disease-modifying therapy that has stabilized me." 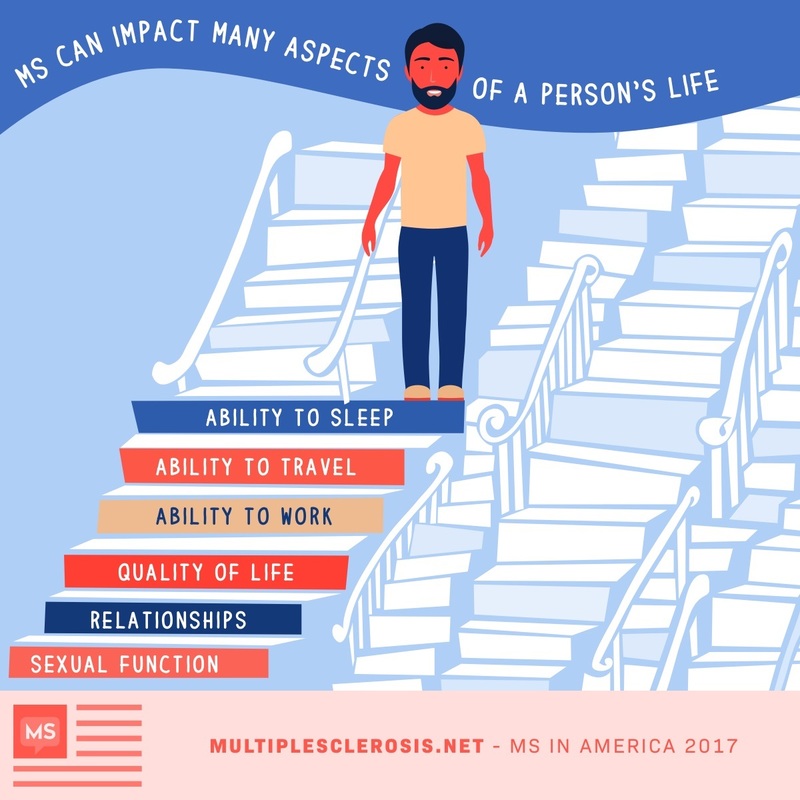 MS is known for issues like numbness and tingling, walking/balance/coordination problems, and fatigue—and all of these symptoms impacted more than one-third of respondents prior to diagnosis. However, these are by far not the only major symptoms, according to those surveyed. Major symptoms currently reported by respondents include fatigue (87 percent), numbness/tingling (75 percent), memory loss/brain fog (70 percent), muscle weakness (64 percent), pain (55 percent), depression (53 percent), and vision problems (30 percent). "Many people don't realize that some of the worst MS symptoms are invisible. Severe pain, depression, and cognitive difficulties like memory loss are common in those with MS, but many MS patients themselves don't even realize they are related to the disease. Not only are these symptoms difficult to live with, we also struggle to explain them to others, sometimes even doctors, because they can't see them," Garlit added. The survey revealed pain to be a common occurrence for many with MS, and the impact it and other symptoms have on a patient's personal life can be profound. Respondents reported feeling pain's effect in areas such as mood, sleep, the ability to work, overall quality of life, and relationships. "I never knew how many different types of pain there were before having MS," said MultipleSclerosis.net patient advocate Stephanie Buxhoeveden. "One of the most difficult things about MS-related pain is that it is invisible, which makes it challenging for the people around me to understand how I'm feeling. Often I am putting all of my energy into getting through the day, so it is difficult to expend the time and energy into explaining my symptoms to others so I choose to 'tough it out' and pretend like everything is fine." "The results of this survey clearly show that people with MS struggle with a disease that impacts all aspects of their life in ways that many around them simply cannot see," said Tim Armand, President and co-founder of Health Union. "This is where a community like MultipleSclerosis.net can make a significant difference. It brings people with similar experiences together to provide and receive support, share information, and feel validation." A summary of the survey results, an infographic series and a video are also available. Health Union inspires people to live better with challenging health conditions - combining new, original, daily content with unique shareable artwork and robust social media conversation to cultivate active online health communities. Health Union platforms are unique ecosystems dedicated to illuminating the voices and experiences of people with type migraine, rheumatoid arthritis, type 2 diabetes, hepatitis C, and more. Its services and offerings foster open and honest interactions about these health conditions between and among patients, caregivers, professionals, providers and industry partners to help all stakeholders make more informed decisions about healthcare. MultipleSclerosis.net is Health Union's online community dedicated to people living with MS, where patients and supporters of people living with this condition can connect, share experiences, and learn about managing the condition. 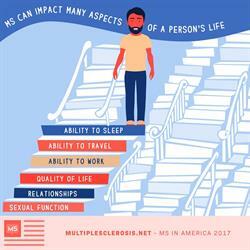 This "MS in America 2017" infographic illustrates how multiple sclerosis can affect many aspects of a person's life.